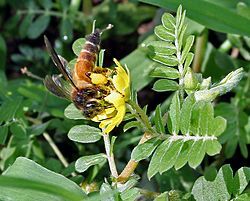 Apocrita is a suborder of insects in the order Hymenoptera, the other being Symphyta. 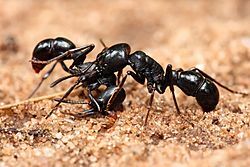 Included in the group are the ants, bees, wasps, braconids, ichneumons, chalcids, nearly all parasitic hymenopterans, and a few other forms. The suborder includes the most highly evolved members of the order. There are well over a hundred thousand species distributed worldwide. Wikispecies has information on: Apocrita. Apocrita Facts for Kids. Kiddle Encyclopedia.